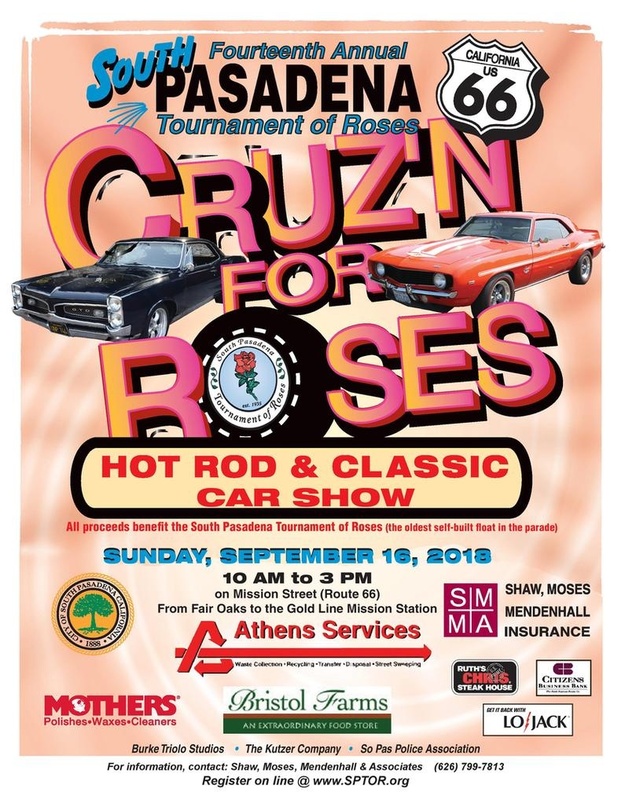 Roadsters, classics, even a variety of newer vehicles in a category all its own, will be on display Sunday, Sept. 16, for the 14th annual Cruz’n for Roses Hot Rod and Classic Car Show along legendary Route 66 in South Pasadena. Through company sponsorships and entry fees from participants, the free event traditionally raises funds for the city’s Rose Parade float entry, which is currently under construction in a giant tent in the 400 block of Fair Oaks Avenue behind the War Memorial Building. 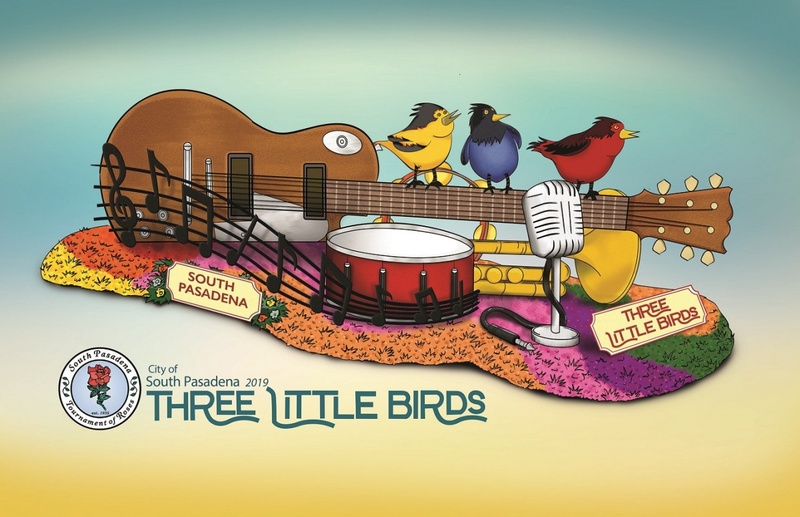 Organizers say the float – “Three Little Birds” – will cost about $100,000 and every last dollar is needed to complete the massive project. PHOTO: City of South Pasadena | SouthPasadenan.com | Funds from Sunday’s car show along Mission Street in South Pasadena will help defray the construction costs, including steel and flowers. Come December, you’ll likely hear Benjamin’s name again as she also serves as the SPTOR’s decoration chair, putting a team of volunteers into action, painting the underbelly of the float before thousands of flowers cover it in the final days leading up to the New Year’s Day spectacle down Colorado Blvd. in Pasadena. Those entering their cars in the show will have an opportunity to win one some dozen trophy categories as judges will spend the morning hours in search of the best American customs, street rods, muscle cars and classics. For the second year, judging will also be open to newer vehicles – post 1975. What’s different about South Pasadena’s car show from others, insists Benjamin, is the amount of people it draws each year. 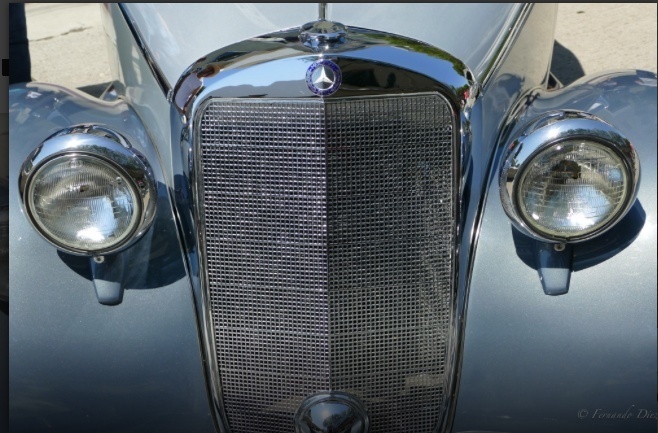 Anywhere from 5,000 to 10,000 are expected to descend upon South Pasadena’s Mission Street on Sunday to take in the beauty of some 200 vehicles on display. Classic car show participants make a $30 contribution to the South Pasadena Tournament of Roses to show their vehicles, with fees set at $40 on the day of the event. PHOTO: Cruz’n For Roses | SouthPasadenan.com | Classic cars like the one above will be on display during Sunday’s Cruz’n for Roses Classic Car Show. 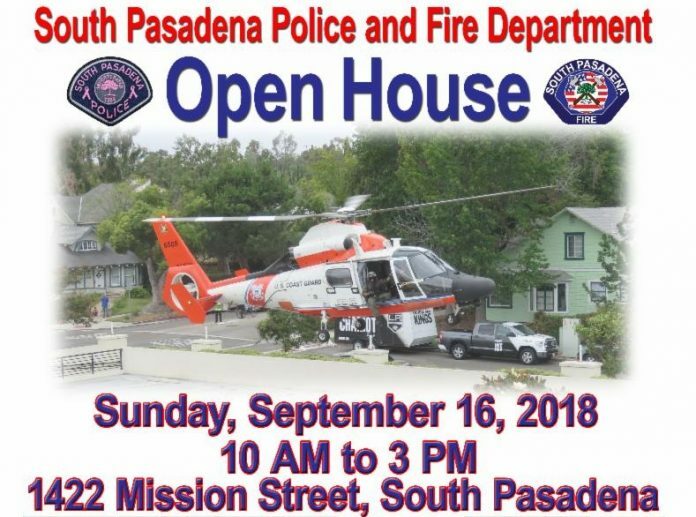 In addition to the car show, the South Pasadena police and fire departments will stage their annual Open House from 10 a.m. to 3 p.m. at 1422 Mission Street. The free event will feature safety information, vendor displays, giveaways, a demonstration involving police canines, fire officials putting simulated fires, and tours of both the police and fire departments. The family outing will also allow kids to jump in the seat of police cars, climb aboard a fire engine and view a helicopter from ground level. There will be information about emergency preparedness, alarms, crime prevention and fire safety tips. Helicopter landings, station tours, police and fire demos will also be a part of the event. A line-up of famous cars, some of which include “Herbie the Love Bug,” the “Dukes of Hazzard,” a DeLorean from “Back to the Future” and Austin Powers’ “Shaguar” will be parked in front of the South Pasadena Police Department as part of the open house. American Red Cross in the fire station apparatus floor. *Times are approximate and helicopters are subject to call. Emergency Preparedness hands-on demonstrations continuous throughout the day at the fire station Police Station Tours, continuous throughout the day.